Barjan Stainless Steel 4 Light Air Cleaner Light Assembly. 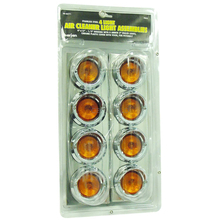 Features 4"X13" - 1/2" Housing With 8 Amber 2" Sealed Lights, Chrome Plastic Cover With Visor For Peterbuilt Trucks. Comes With Wiring Leads In Displayable Clam Package.